Beyond the competition, anyone who was at the 1982 DCI World Championships will perhaps best remember the 41-degree Fahrenheit chill that descended upon Montreal’s vast Olympic Stadium during the Finals. Creating their own on-field heat, Santa Clara Vanguard unveiled a surprise return of their famous “Bottle Dance.” The screaming of the audience was so intense that corps members couldn’t hear from side to side, and half the brass players ended earlier than the other half. Blue Devils became the first DCI corps to complete a season undefeated, while the Garfield Cadets earned their first top-three placement. The Cavaliers placed 11th at the Finals, moving up from 12th in Prelims. With color guard designer Steve Brubaker taking charge of the drill writing, the corps took seventh in the visual analysis caption. 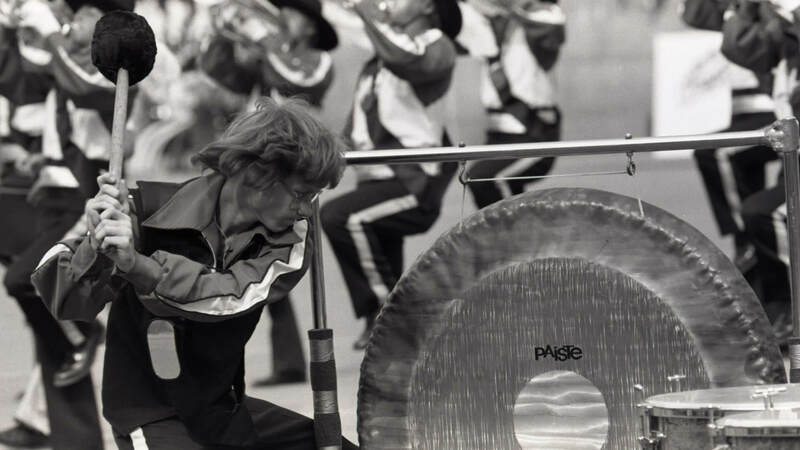 A few months earlier, he led the corps’ competition guard to its second of three consecutive Winter Guard International World Championship titles. The show opened with two movements from Ottorino Respighi’s “The Pines of Rome,” written in 1924 as part of his “Roman Trilogy” that included the earlier “Fountains of Rome” and the later “Roman Festivals.” “Pines of the Villa Borghese” was originally the first of four movements that portrayed events around the city’s famed pine trees. This movement was written to express the joy of children playing amongst the famed gardens of the Villa Borghese, an enclave for Borghese family who were one of the most powerful families in the history of Rome, as well as leading benefactors of the arts. The second movement performed by the corps was the suite’s concluding movement, “Pines of the Appian Way,” which represented the legions of Roman soldiers marching into the city in ancient times. The Appian Way was one of the world’s first long roads to be paved with stones, created for the benefit of moving the Roman Army in and out of the city. Throughout the two Respighi movements, there was little in the way of quickly mutating geometric drill evolutions that were soon to become Brubaker’s trademark. The following percussion feature was based on “Heliopolis,” written by saxophonist Jay Bechenstein for Spyro Gyra, a jazz fusion band he founded. The title is Greek for “Sun City” and typically refers to one of ancient Egypt’s oldest cities, now buried deep under the present metropolis of Cairo. The piece came off the band’s most commercially successful album, “Morning Dance,” released in 1979. The visual highlight of the piece was the color guard, in three pivoting parallel lines surrounded by a circle of horns, sequentially tossing flags over the tossed and spinning rifles. Two timpanists played on seven timpani kettles set on the front sideline, creating an effect more melodic than rhythmic. The four members of the mallet section carried their instruments on harnesses, even though it was now legal for keyboard percussion to be grounded on the sideline. The funky production of “City” was written by Jeff Lorber for his band, Jeff Lorber Fusion. The piece was recorded on the “Wizard Island” album of 1980, the band’s fourth of five albums and the first to hit the top of the jazz charts. Among the members playing on that release was a young saxophonist named Kenneth Bruce Gorelick, known today as Kenny G.
The seven timpanists continued to be used during the work, concluding with the color guard members up front performing cartwheel flips, which a few months earlier had delighted WGI audiences. The following concert standstill production was a combination of “I’ve Had Enough” and “Ai No Corrida.” “I’ve Had Enough” was written by Philip Bailey, Greg Phillinganes, and Brenda Russell for Earth, Wind & Fire’s 1981 11th studio album, “Raise!,” which went platinum in the U.S., also winning the Grammy Award for best R&B performance by a duo or group. “Ai No Corrida” was written by Charles “Chas” Jenkel and Kenny Young and first recorded on Jenkel’s 1980 debut album, “Chas Jenkel.” Jenkel was best known as a guitarist and keyboardist for Ian Dury and the Blockheads, a 1970s New Wave band from England. Young is best known for co-writing the smash hit, “Under the Boardwalk,” made famous in 1964 by The Drifters. The closer of “Softly As I Leave You” returned from the corps’ productions in 1980 and 1981. It was written by Giorgio Calabrese and Antonio DeVita with the Italian lyrics translated into English by Hal Shaper. The piece first hit big in Italy in 1960 with the title “Piano,” the Italian term for “Softly,” and was made popular in the U.S. when Frank Sinatra picked it up and performed it as one of his signature pieces. The audience especially loved the sequential forward somersaults of the 12 color guard rifles, tumbling with their rifles in the air and catching the rifles upon completing the somersaults. 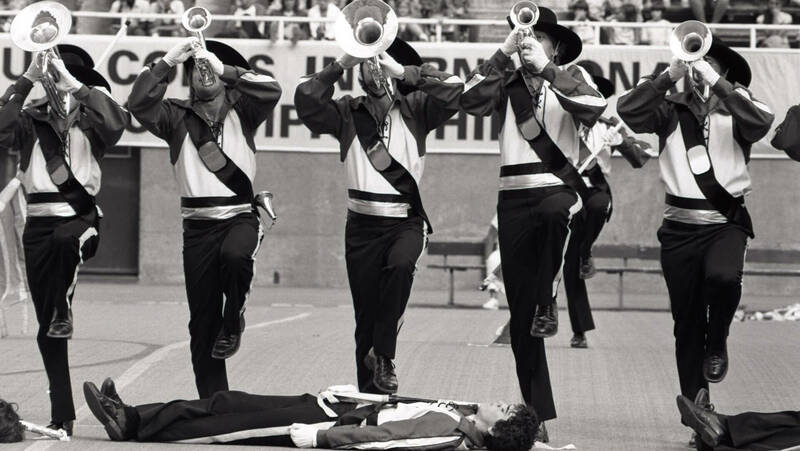 After that, the horn line stepped over the rifle members, but only after pausing mid-step, with their legs hovering over the prone guard performers. It was a maneuver first performed by the corps in 1981 that would become iconic of the Green Machine. For this week only, you can save on the Legacy Collection DVD that contains this complete Cavaliers performance, along with all finalists from the 1982 DCI World Championships. Buy the 1982 Legacy Collection DVD. Discount DVD offer ends Monday, October 5, 2015.